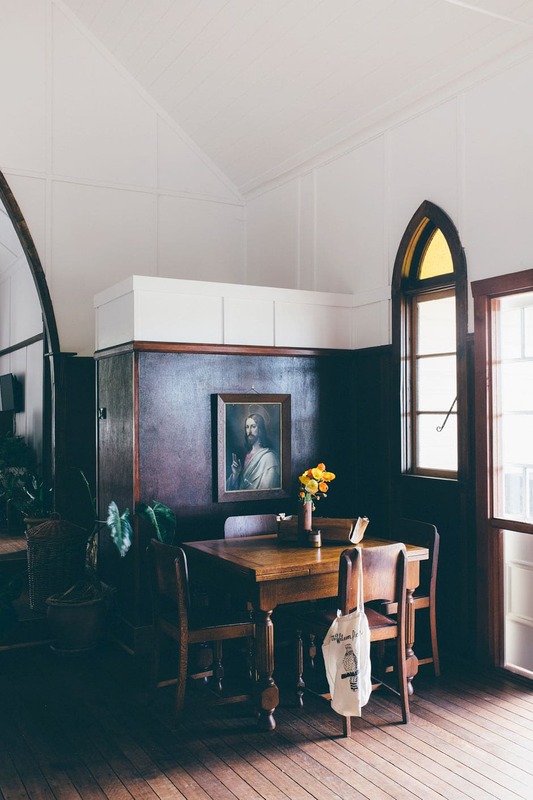 This former church has turned out to be the answer to its owners’ prayers. 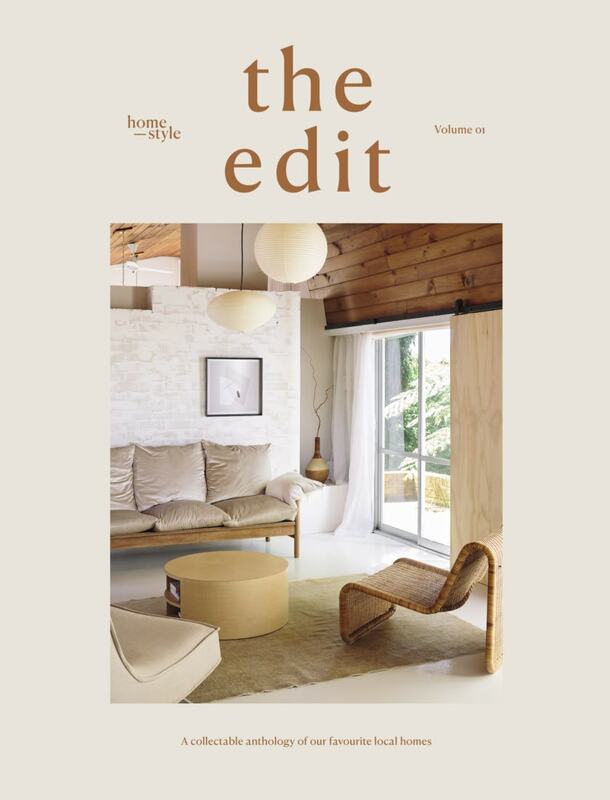 In the quiet town of Billinudgel in the Northern Rivers region of Australia’s New South Wales is a dwelling that gives meaning to the words ‘sustainable living’. 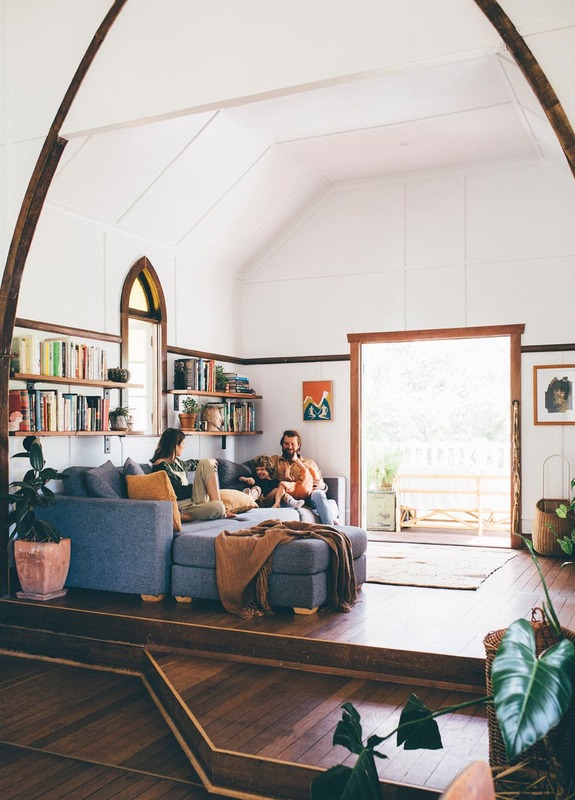 Here, naturopath Amanda Callan and musician Andrew Morris have repurposed a 1930s church into a family home where they’re raising their two young sons, Banjo and Percy. ABOVE The kitchen cabinetry and island are made entirely from recycled materials. 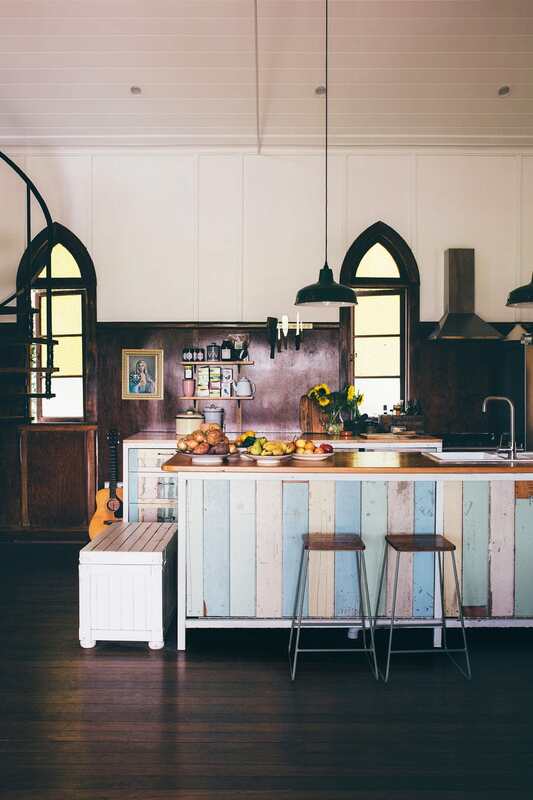 When Amanda’s sister renovated her own home, Andrew seized the opportunity to upcycle some of the walls; the metal frames once lived in Amanda’s parents’ workshop; and the benchtops were crafted from some of the church’s old pews. Meanwhile, the Portuguese fireclay sink was bought from an online restoration shop and the stools from local maker Martin Johnston. Andrew plays guitar in the solo band of his friend, former Powderfinger frontman Bernard Fanning, and is also a member of bluegrass band The Wilson Pickers. His growing collection of guitars can be spotted throughout the house. The family moved in when Banjo was just six weeks old. At that stage, the building was essentially just an open hall, so adding a kitchen was a key priority, and aside from the sink and appliances, they built it using pre-loved materials. That sorted, the family lived happily with the open-plan configuration until 2015, when they learned Percy was on the way and realised they were going to need a bit more personal space. Engaging architect Hayley Pryor of Harley Graham Architects and their builder friend Chris King to help action their plan to create separate bedrooms, update the existing bathroom and laundry and add more storage, they tucked a new bedroom for the boys beneath the mezzanine level and located theirs overhead, along with an ensuite that wasn’t part of the original plan but is, according to Amanda, “the best addition ever”. 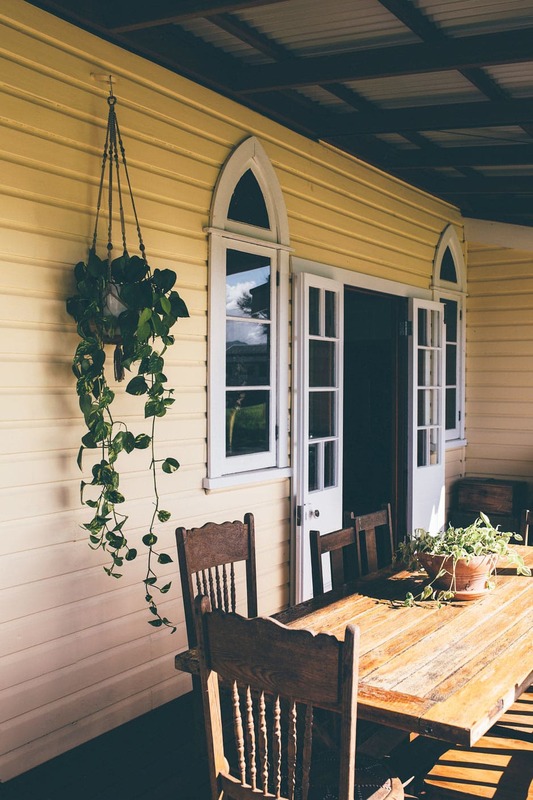 A wall in the altar area (which is now the living room) was knocked down to make way for double doors that connect to a little deck, the back garden and a newly built self-contained cabin. 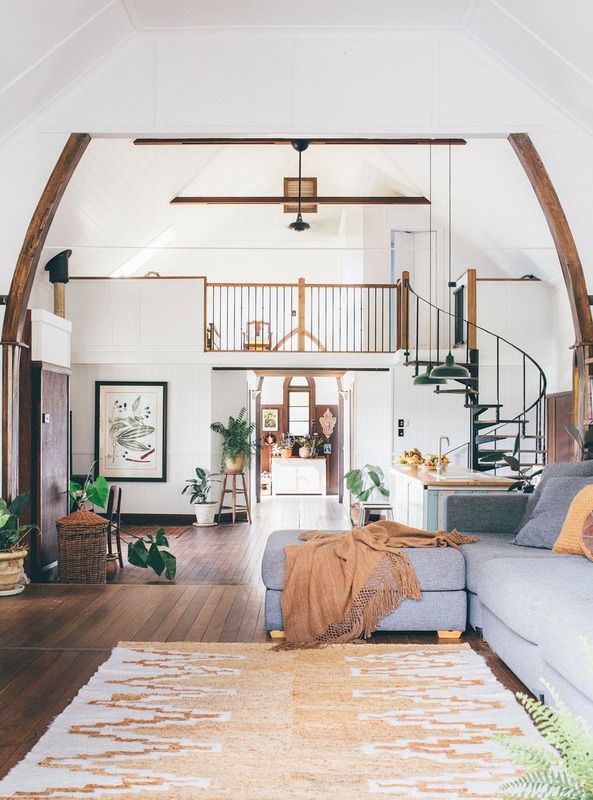 Velux windows were added throughout to usher in more light, and the final flourish came in the form of an incredible spiral staircase Amanda found on eBay. The steel beauty was a little larger than they expected, so they had to move some of the kitchen plumbing over to make way for it, but it has turned out great. Previously bronze with shiny treads, the couple had it powder-coated in black, then sanded back the treads before staining them with a natural stain to mellow them out a bit. TOP The oak dining suite was bought second-hand off Gumtree from an older couple who were the third generation in their family to own it. “We told them we’d take special care of it,” says Amanda. The print was picked up at a garage sale. ABOVE Andrew had held on to this cabinet for years — now it sits in the entryway surrounded by vintage finds. The couple collects religious treasures that befit their unique abode. In March 2017, Cyclone Debbie hit the north-eastern coast of Australia, causing severe flooding in the Northern Rivers area. 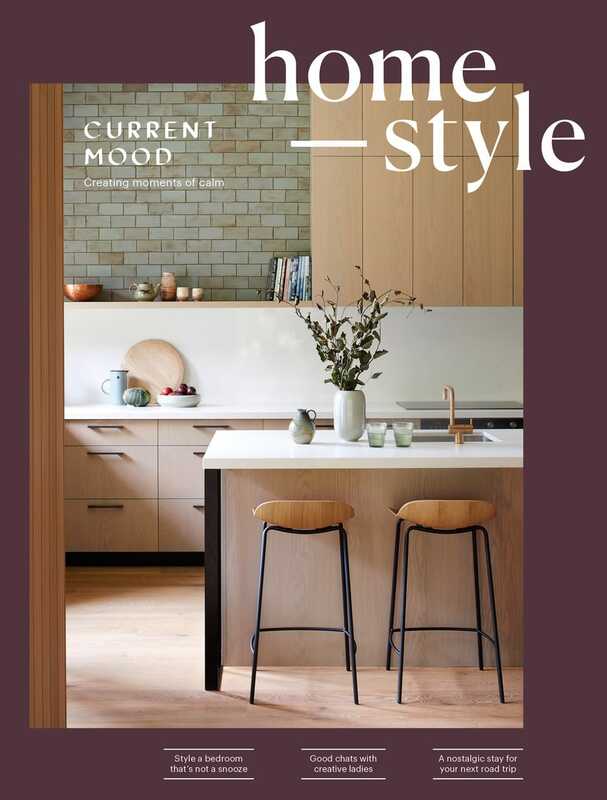 Two years on from their initial renovation and in response to this, their second flood, Amanda and Andrew decided it was time for another update. 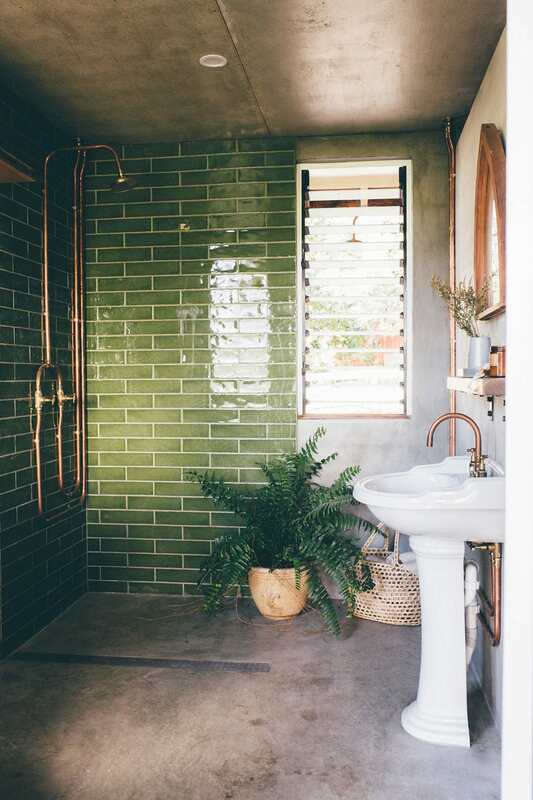 TOP & ABOVE Although the couple was a little nervous about committing to the green subway tiles from Byron Bay Tile Merchants in their main bathroom, Amanda says, “We thought they’d look great with our dark green plants and copper pipes. 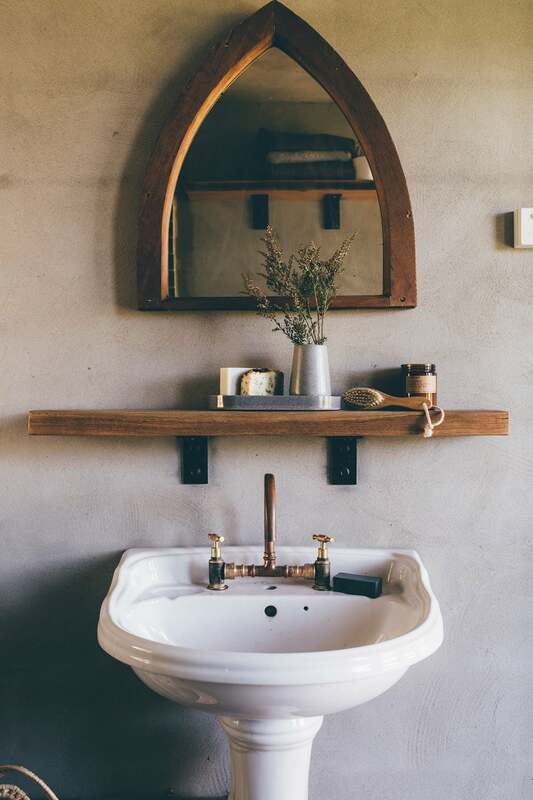 Now I’m so happy we did it because we really love them.” The concrete bathrooms they’d admired on their travels in Morocco were the inspiration for the remainder of the material palette, creating a space that’s flood-friendly if they’re ever struck again. 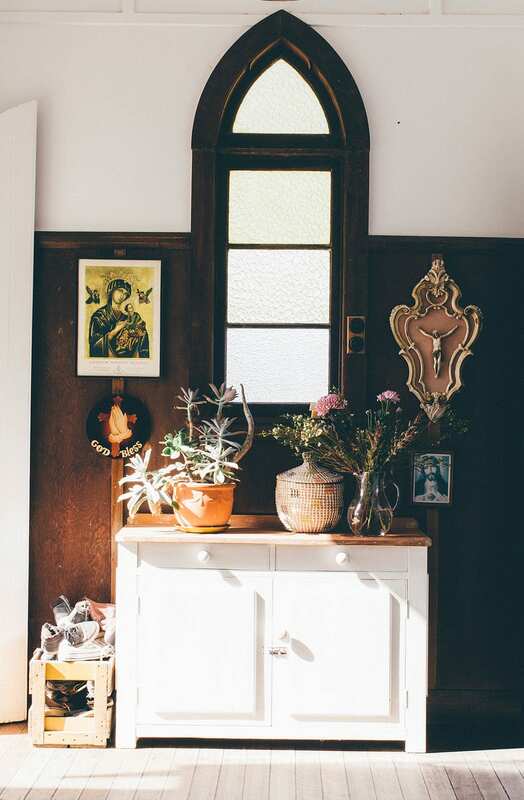 For a mirror, they repurposed an old church window; Andrew made the shelf from local hardwood that he sanded and set on brackets; and the sink is a porcelain hand-me-down from Amanda’s parents’ place. The church is heritage listed, so before the couple bought it in 2012, they submitted their proposed renovation plans to the council to ensure they’d eventually be able to raise the building and add decking. “It was approved for five years before we started renovating,” says Andrew. “But in hindsight it was good that we lived here for a few years first, because we really got a feel for the building and what we wanted, which made us very sure of our decisions. 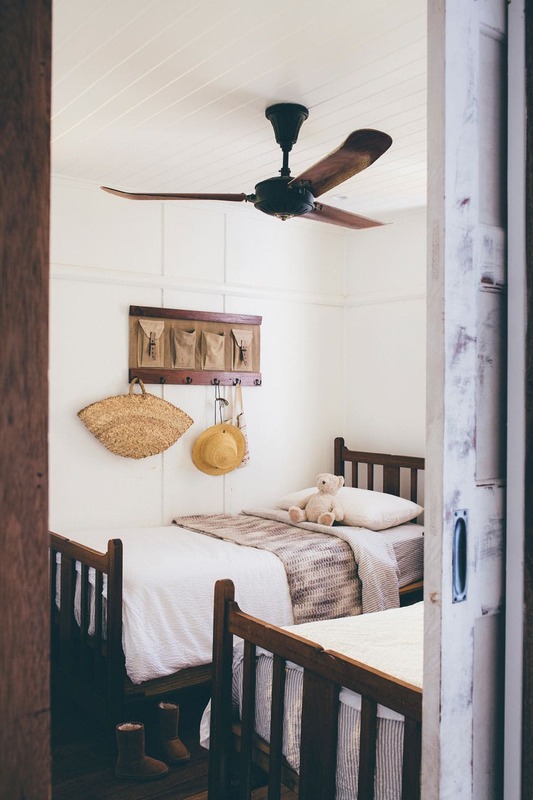 ABOVE In the boys’ room, antique beds are dressed up with pillowcases and sheets from Ecolinen Organic. 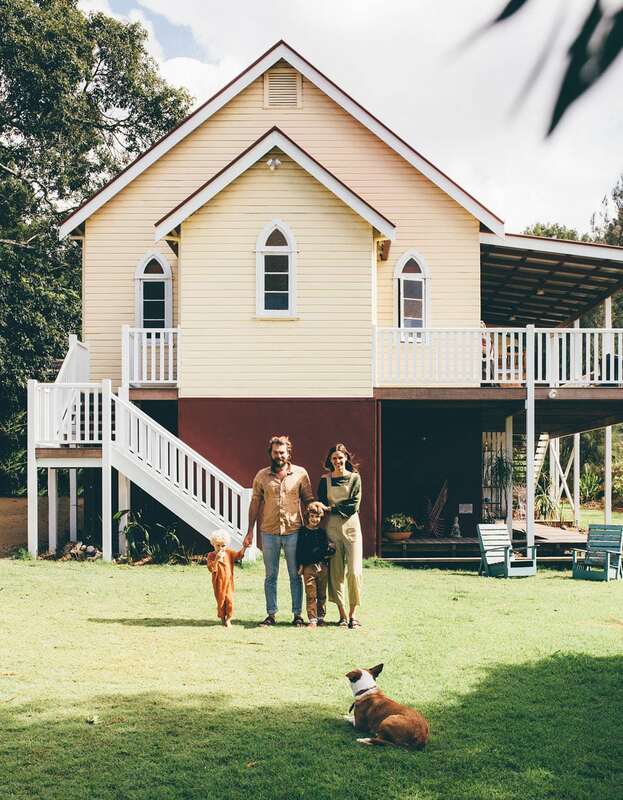 This enchanting property has also inspired Amanda and Andrew’s business, Church Farm General Store, which has grown from a hobby into their full-time job. They make soap, sauces and curry pastes, and their emphasis on top-quality and home-grown ingredients has seen their natural products become kind of a big deal; sales at the local farmers’ markets increased to the point that they had to take over a larger farm to keep up with the demand. ABOVE Meals are often served outside around the well-loved timber table. Andrew designed a fire pit with a grill he had a local steelworker make, so he and Amanda also love having big cook-ups with their family and friends. The next addition to their home will be some solar panels.